Verias is a guerilla-type Bakugan with a screeching battle cry. It carries a staff and uses it for attacking and protection. Using the staff like a pole vault, this allows Verias to travel great distances quickly. A blinding beam of light shoots out from the purple jewel atop its forehead. 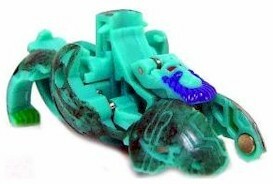 A fantastic climber makes this Bakugan difficult to catch. Its dense fur keeps it warm in the coldest weather. Purchase Verias from Amazon now!